Light duty accommodation is the practice of allowing an employee to work a job that’s easier for them to do as they’re recovering from an injury or dealing with a medical condition. Light duty work is a type of accommodation regularly offered by employers in compliance with workers’ compensation, disability or pregnancy laws. To ensure compliance with federal labor laws like FMLA and workers’ compensation, we recommend working with a payroll service like ADP. In addition to providing HR and payroll software, ADP can track employee leave and document which workers are on light duty. Disclaimer: Fit Small Business cannot provide legal advice. Therefore, before implementing or enforcing a light duty policy, we recommend you consult with your labor law attorney. Here is a light duty template you can download and modify. Download the light duty policy template as a DOC or PDF file. Light duty work refers to the kind of job that meets an employee’s temporary medical restrictions and helps the employee as they prepare to transition back to their regular job. 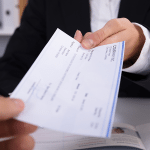 It is a way for a worker to remain employed while recovering from an injury or temporary health issue, allowing them to continue to receive a paycheck. All jobs have required duties. They may include being able to speak, stand, lift, drive or provide other essential functions of a job. When an employee is unable to do those essential functions due to a short-term medical condition or injury, they may be offered a light duty work assignment instead. Light duty accommodation is a best practice way to deal with short-term health concerns in a fair and consistent manner. However, light duty is not meant as a permanent solution. For example, if an employee pulls a muscle in their back and can’t lift, light duty can keep them working in a role that doesn’t require lifting until the pulled muscle heals. While employers with less than 25 employees are not obligated to comply with state laws, like California’s Family Rights Act (CFRA) or the federal equivalent Family and Medical Leave Act (FMLA), there are still numerous laws that address the employer’s obligations to provide accommodations to employees who return from a medical leave. Before addressing the employee’s limitations, an employer must first determine what legal obligations apply at the state level. For example, employers with five or more employees must comply with California’s Fair Employment and Housing Act (FEHA) and provide reasonable accommodations to employees with physical or mental disabilities. However, employers with 15 or more employees must also comply with the Americans with Disabilities Act (ADA). The point being, it is critical for employers first to determine which laws apply so they can ascertain the legal obligations. There’s really no cost to administering a policy except perhaps the loss of worker productivity. In addition, you may want to track details about those assigned to light duty roles in a software system. Those costs are relative and optional. In general, the short-term productivity loss you experience by placing a worker in a light duty role will likely be offset by employee loyalty and retention. Light duty work is a type of workplace accommodation that’s often associated with labor laws meant to protect workers. However, no labor laws specifically require it. Employment laws like the ones listed below, as examples, may dictate that reasonable accommodations be made. One of those reasonable accommodations may, in fact, be light duty. Here are accommodations that may make sense based on applicable labor laws. Workers’ Compensation – Workers’ Compensation regulations vary by state. If a worker injures themselves on the job, light duty may make sense to get them back to work. If they are willing and able to return to work, a job role that doesn’t require lifting or other physical exertion may be the best option until they fully recover. Americans with Disability Act (ADA) – The ADA prevents discrimination against disabled persons. Businesses with 15 or more employees are subject to abide by the ADA. For example, if a worker with a disability suffers a setback such as a drug interaction that affects their balance, light duty work may be a reasonable accommodation until their condition stabilizes. Family Medical Leave Act (FMLA) – The FMLA applies to employers with 50 or more employees and allows eligible workers to take up to 120 days of unpaid leave without risk of losing their job. For example, should a worker choose to return to work after a medical procedure, like shoulder surgery, light duty work may serve as a reasonable accommodation to keep them employed and productive. Once they recover, they can transition back to their regular role. Pregnancy Discrimination Act (PDA) – It’s not uncommon for a business to offer a pregnant employee light duty during pregnancy if she’s able to work, yet unable to do all the physical aspects of the job, e.g., stand for extended periods, lift, or deal with extreme temperatures. It’s up to both the worker and the employer to agree on what’s best. In many cases, a worker with physical issues is able to take FMLA leave. However, that often leaves the employee without an income and the business without a worker. Light duty work can resolve both issues. Given the various laws that require reasonable accommodations for employees who are disabled, injured or pregnant, light duty work may come into play in a myriad a ways. How you, as a business, manage light duty depends very much on factors such as your company size, open jobs, and the type of business you’re in. An employee injured on the job is often provided an accommodation while they’re in recovery. Let’s say an employee doing oil changes had a customer back up a car over their foot, The worker is entitled to a workers’ compensation temporary disability benefit. However, once that worker is able to return to work with restrictions, an accommodation may come into play. Perhaps their doctor suggests they not stand for long periods of time while the injury heals. The employer might, therefore, assign the worker to a sit-down diagnostic workstation or allow the employee to work the service counter for six to eight weeks as a light duty accommodation. It’s not uncommon for employees to have occasional health issues. Let’s say your nighttime stocking clerk came down with the flu, which turned into pneumonia. Carrying heavy boxes and moving in and out of the cold aren’t helping, and they don’t want to take FMLA leave because they can’t afford the time off. You might consider offering less strenuous work like taking inventory or cleaning up the inventory database while they recover their health. That would allow the employee to continue to receive a paycheck and you to keep a good employee happy. The alternative would be that the employee may have to take FMLA and lose their income. Your business, in turn, would suffer the loss of that employee in the short term. A pregnant employee may fall under the guidelines of the ADA, FMLA and/or pregnancy discrimination laws. Therefore, companies are expected to provide reasonable accommodations. Perhaps the pregnant employee’s doctor has suggested that she no longer wait tables during the busy night shift due to heat, extensive walking, and stress. Assuming she wants to continue working, an accommodation may be to move her to a day shift that’s less stressful or let her serve as a hostess instead. Of course, light duty is an option only if she feels able to do it. Otherwise, due to her pregnancy, she retains the right to take FMLA leave if she is eligible and has not yet used up her FMLA benefits. As a general rule, employers should always engage in an interactive process to determine what accommodations, if any, can be provided to permit the employee’s return to work. This process requires the employer sharing information with the employee and their health care provider so the parties can reach a determination if the employer can provide accommodations and the employee can perform the essential job functions. Employers who do not determine which laws apply and fail to engage in the interactive process are exposing themselves to significant liability. Moreover, an employer who determines an employee cannot perform the essential job functions will have the legal burden of proving that fact if the employer decides to terminate the employee after attempting to, in good faith, comply with the CFRA, FMLA, FEHA, ADA and/or any other applicable laws that might apply (i.e., oftentimes, various cities and/or counties have their own regulations that may apply in addition to federal and state laws). Implementing light duty and clarifying when light duty work might be the best option for an employee is best done in advance by creating a light duty policy. In addition, your policy may need to reference the kind of work your business does, along with the kind of situations and light duty work options that might be appropriate in that business. Here are the steps to take to implement light duty in your workplace. The first step in implementing light duty is to have a policy in place. This policy should include three sections: what light duty is, why it’s offered, and how to request it. Once the policy is created, you can add it to your employee handbook and provide a copy of it to new hires during onboarding and orientation. We’ve provided a downloadable template you can use as a starting document. Be sure to describe your company policy for offering light duty accommodations. This may include a statement such as: to provide a supportive work environment, our company may offer light duty work in compliance with federal labor laws as a reasonable accommodation when an employee is dealing with injuries or health issues. Since light duty is a short-term solution, consider providing a time frame limit on light duty work accommodations, such as six weeks or 120 days. By being specific on the duration, you avoid having employees turn their light duty role into a permanent easy job. 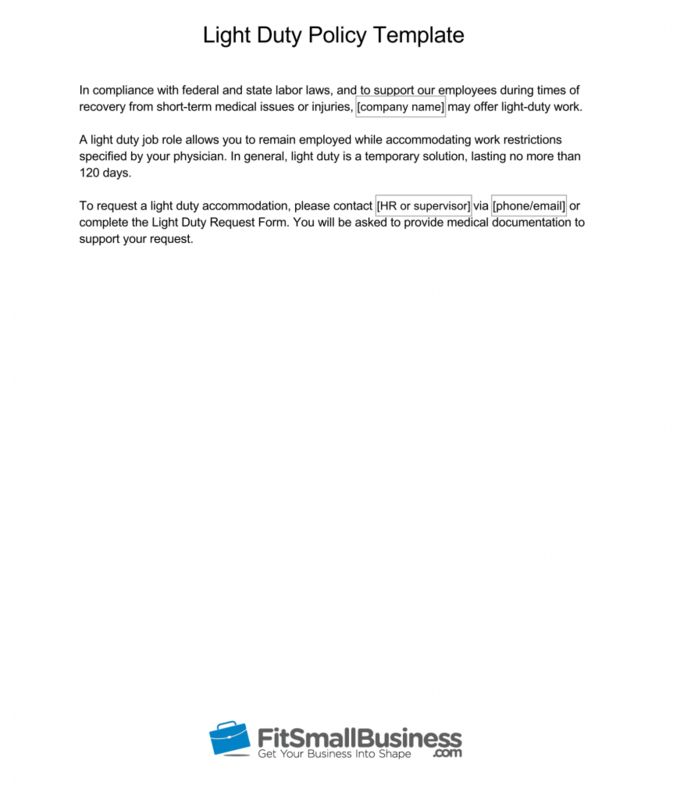 Provide information on how an employee may request light duty work in terms of forms they need to complete or who they need to send a request form to. Employees who are pregnant or dealing with a short-term medical issue will need a way to request light duty accommodations. Your process can be as simple as asking them to send you an email and to provide you with a doctor’s letter describing any work restrictions. A sample light duty request form is provided here as a DOC or PDF file for you to download and modify for your specific process. Should light duty work be a reasonable accommodation for an employee who suffered a workplace injury, the employee may not need to request light duty. In fact, the workers’ compensation documentation may require the employee to return to work or risk losing their disability benefits. In that case, the request for light duty will come from the employer to the worker. A sample letter is shown below in step four. With information from the employee’s doctor, you will be able to determine what the employee’s work restrictions are. You’ll likely also have an idea as to how long the employee may need to be in the light duty role. You can then determine whether a short-term position is available and light duty work can be accommodated. Based on your findings, your next step will be to offer or decline the light duty request. Be aware that declining a request may subject you to a discrimination or wrongful termination lawsuit unless you’re able to show that the light duty accommodation would result in an undue hardship for the business. NOTE: If you choose to decline the request, document why the request would cause a business hardship. Consider having your business attorney review your decision to confirm that it will stand up in case of a lawsuit. 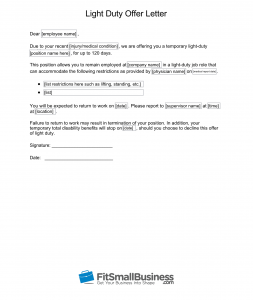 Next, communicate the terms of the temporary work assignment to your employee in a letter. Your light duty accommodation letter should reference the job title or position name, work restrictions, the time frame and expectations, such as when and to whom the employee will report. If appropriate, such as in a workers’ compensation situation, your light duty accommodation letter may also include consequences for failure to accept the offer. 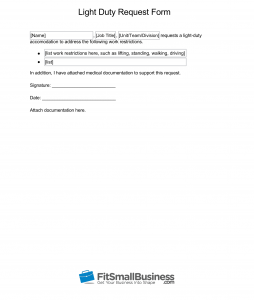 A sample letter has been provided above that you can download and modify as a DOC or PDF document. Businesses with more than a handful of employees may want to use software to track which employees are on light duty. Once an employer reaches 50 or more workers and is subject to FMLA guidelines, labor law-compliant HR software is a must. It will help you keep track of who is on light duty and for how long. We recommend businesses of all sizes consider HR or payroll software that can keep track of job descriptions, pay rates and leave. These help manage issues like workers’ compensation, FMLA and ADA compliance as well as provide document storage for your policies and work agreements. We recommend ADP as a labor law-compliant payroll software. They offer services to ensure that your business provides appropriate documentation to support workplace accommodations. They also provide consulting on HR best practices. As noted earlier, offering an accommodation isn’t really costly. In fact, it can benefit your business by letting your employees know that you care about them and their livelihood. Below are some of the pros and cons of providing light duty work to employees on a temporary basis when they’ve been injured or are recovering from a medical situation. Employee Retention – You’ll retain solid employees and save the cost of having to search for, hire and train new ones. Replacing employees can cost thousands of dollars. Labor Law Compliance – You’ll avoid costly fines, as well as increase your chances of winning a lawsuit, should an employee sue for discrimination or wrongful termination. Goodwill – Your customers and the employee’s co-workers will see your efforts to assist staff in transitioning back to work. 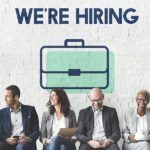 That can improve your employment brand. Failure to Accommodate a Legitimate Request – If you fail to accommodate a reasonable request and are unable to present an undue hardship rationale, you may be putting your business at risk of a lawsuit or labor law investigation. Light Duty May Become Permanent – If you forget to specify a time frame, you may find an employee turns their light duty work into a permanent job. Therefore, it’s critical you set a time limit, such as 90 or 120 days, and make clear that light duty is a temporary, not permanent, job placement option. Employee May Take Advantage – It’s best to allow light duty only after being provided with medical documentation. That documentation should specifically list the work restrictions requested. For example, an employee who says their back hurts, but fails to provide documentation, may be someone taking advantage of your generous nature. Fairness and Equity – You can’t discriminate on who you grant light duty to. For example, if one employee is given light duty for six weeks after a surgery, you can’t then deny another worker who requests a similar accommodation without opening yourself up to a charge of discrimination. If light duty work isn’t the best alternative for your employee or your business, consider other ways in which you can accommodate an employee’s personal needs while they’re recovering from an injury or dealing with a health issue. Light duty is only one example of a reasonable accommodation. It’s possible that there’s another job in the company the employee could do. For example, a truck driver struggling with vision issues may prefer to work in dispatch. If another job is available, consider allowing them to transfer to a different role permanently. Of course, a job transfer may change their pay rate, whereas a light duty role typically doesn’t affect their compensation, as it’s only temporary. Some employees may prefer to work reduced hours while recovering from a medical issue, injury, or dealing with health-related concerns, such as a pregnancy. As long as you and the employee are in agreement (and they are not being “forced” into a part-time role), part-time work may suit your business and their short-term needs best. Similar to a light duty offer letter, document the time frame and job-specific changes in a letter signed by your employee. Office workers and those who work with computers and software may find that working from home as they recover from an illness or an injury works best. This is an example of a reasonable accommodation that isn’t light duty, per se. Nonetheless, it may allow work to be done for your business while temporarily accommodating the employee’s health issue and recovery. A customer service rep in a call center who had surgery for lung cancer, and can no longer be understood over the phone, may, in fact, be unable to do the essential functions of the job—talking. Failure to do the essential functions may be grounds for termination if no reasonable accommodation can be made. A home-service worker who is required to drive a company vehicle may need to be terminated if after a knee replacement, and exhausting their FMLA leave, they’re unable to drive a work vehicle, walk more than ten feet, or bend and crouch to do their work. These are essential functions of the job. A forklift operator who is taking medication for a condition may be terminated if the medication causes confusion and disorientation, making the driver unsafe driving equipment. Due to the risk of terminating a disabled or injured employee, we recommend you seek the advice of a labor law attorney before firing an employee based on their inability to do essential duties. You’ll need to make sure you’ve exhausted other options, such as FMLA leave or reasonable accommodations. LawTrades is a legal service we recommend. They can prepare documents such as termination letters starting at $250 per document. In addition, you can contact them for ad hoc legal questions and advice on labor issues for as low as $150. Here are common questions you may have about offering light duty work to employees. What kind of light duty work makes sense for a pregnant employee? While it depends on the job and the employee’s work restrictions, many pregnant workers may need a light duty role that requires less standing, walking or lifting. In addition, they may require a job that enables them to sit down, use a restroom more frequently, and be in an environment out of the hot sun or away from chemicals. Am I required to offer permanent light duty to support the ADA? The ADA does not intend for a light duty role to become permanent. Instead, a reasonable accommodation might include allowing a retail cashier who is disabled to sit on a stool instead of standing during their shift. Light duty work, in contrast, is intended to be a temporary solution as a worker recovers from an injury or health issue. What if no light duty jobs are available? It’s possible, especially in a smaller business, that no light duty options are available. In that case, it would likely be considered an undue hardship for your business to pay an employee a salary while they sit in the break room or at home, with no work to do. Let’s say, for example, that your sales manager was in a car accident. After exhausting their FMLA leave, they request a light duty job as they can no longer stand and have trouble concentrating. They would like to be able to sit down and answer phone calls, like the receptionist. However, you already have a receptionist and can’t afford to employ them in that role, especially at their former salary. In addition, you now have to replace them with a new manager to take over the sales management duties they can no longer do (this assumes that sales manager job requires standing and concentration). Keeping the worker on staff would be an expense your small business can’t afford. It would be an undue hardship, in which case you may not be able—and would not likely be required by law—to accommodate. What happens if the employee on workers’ compensation temporary disability refuses to accept a light duty assignment that’s offered? If an employee returning from a workers’ compensation disability leave refuses to accept a light duty accommodation that’s in line with their skills and work restrictions, it’s possible their disability pay may be reduced by as much as 40 percent. You may also have the right to terminate their employment. What if the employee says they’re unable to do the light duty job offered? Light duty shouldn’t be offered or granted based on what the employee states they’re able to do. Instead, it should be granted based on what a physician documents as work-restricted activities. If a worker claims they’re unable to do certain work such as stand or lift, it’s reasonable for you to request documentation in which standing and lifting are listed as required functions on their job description. As an alternative, you could ask the employee to submit to a company-paid health examination, and based on the results, consider revising their light duty requirements. 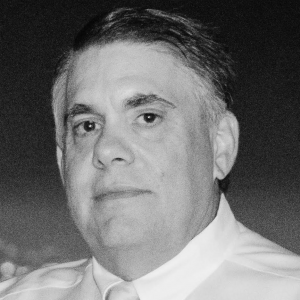 Who can I talk to if I have questions about a light duty request made by an employee? When it comes to labor law issues, it’s best to talk to a licensed attorney familiar with employment law, workers’ compensation, ADA, FMLA and EEOC regulations. We recommend LawTrades as a service that can provide you with on-demand legal consultation starting at $150. In addition, they can draft documents such as termination letters starting at $250 per document. Offering your employees a light duty accommodation when they’re recovering from a health or medical issue is a best practice. In some cases, it may be prudent to avoid a labor law violation or employee discrimination lawsuit. In other cases, your workers’ compensation insurance company may advise light duty as a way to avoid long-term disability costs. For a full-service payroll firm that can support all your HR compliance needs, such as labor laws, FMLA leave and workers’ compensation insurance, consider working with ADP.